United States, United Kingdom, Austria & Czech Republic are where most visitors come from. Topics: Václav Havel, Literární Dílo, Témata, Adresa, and Odkazy. vaclavhavel.cz ::.Václav Havel. 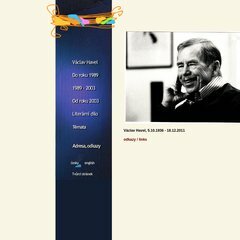 ::The official website of Vaclav Havel, writer .. The site has about 1,123 users daily, viewing on average 3.80 pages each. It is hosted by Webhosting Services, using Microsoft-IIS/6 web server. Its 3 nameservers are ns.forpsi.cz, ns.forpsi.it, and ns.forpsi.net. It is written for PHP/4.4.1 language. PING www. (81.2.194.141) 56(84) bytes of data. A ping to the server is timed at 120 ms, and the average page load time is 522 milliseconds.